Dana Marie Sienkiewicz Whitmore, 61, of Brunswick, Ga., departed this life on Wednesday, Aug. 29, 2018, at Southeast Georgia Health Systems. A native of Jamestown, N.Y., Mrs. Whitmore had been a resident of Glynn County for the past 16 years. She was born February 13, 1957, to the late John Sienkiewicz and the late Dorothy Botka Sienkiewicz. Mrs. Whitmore was a 1976 graduate of Southwestern Central High School in Jamestown, N.Y. Upon graduation, she attended Jamestown Community College where she received her associates degree. Mrs. Whitmore was employed with Glynn County Joint Water and Sewer as a Customer Service representative. 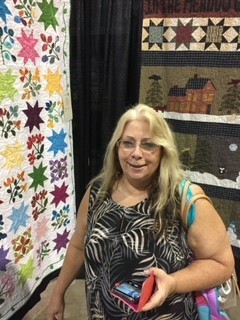 She was a member of Sacred Heart Catholic Church in Lakewood, N.Y., and she attended Pine Haven Church in Brunswick, Ga. Mrs. Whitmore enjoyed quilting, knitting, crocheting, music and spending time with her family and friends. She is survived by her loving husband of 28 years, William E. Whitmore of Brunswick, Ga.; son, John Michael Whitmore of Brunswick, Ga.; daughter Jill Marie (Kenneth) Roberts of Buffalo, N.Y.; sister, Mary J. Sienkiewicz of West Seneca, N.Y.; two grandchildren: Keira Isabella Harding and Thaddeus William Roberts, both of Buffalo, N.Y.; and several other family members. Friends are cordially invited to a visitation with the Whitmore family on Friday, Aug. 31, 2018, from 6-8 p.m., at Edo Miller and Sons Funeral Home, 3321 Glynn Ave., Brunswick, Ga.
A funeral service is to be conducted on Saturday, Sept. 1, 2018, at 4 p.m., in the chapel of Edo Miller and Sons Funeral Home where the Rev. Keith Powell will officiate. Burial will follow with a funeral cortege to Evergreen Memorial Cemetery in Brunswick, Ga. Arrangements are entrusted to Edo Miller and Sons Funeral Home in Brunswick, Ga. www.edomillerandsons.com.